54-40 Was Great - What's the Best Free Concert You've Ever Seen? 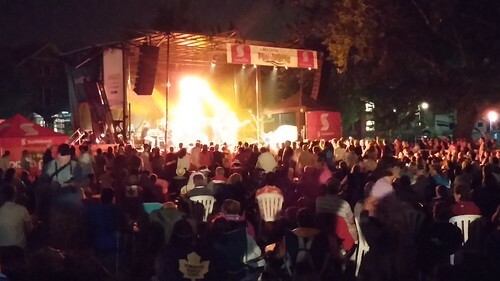 Last night, I saw 54-40 at a free concert in Colonel Samuel Smith Park. They sounded great, playing all their hits (and there were many) and we had a blast. 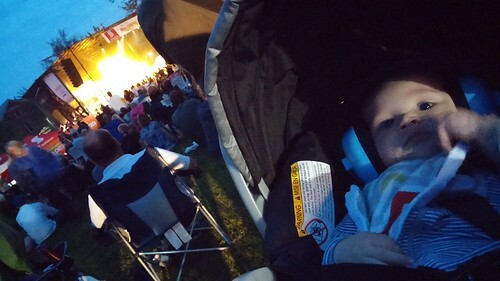 It was this little dude's first concert. As a kid, I saw several "free" concerts at the old Ontario Place forum, but you had to buy tickets to the park to see the show, so it wasn't really free. As a young man I biked to Yonge and Dundas to watch Sloan perform a free concert outside the Edge 102 studio. I thought that was pretty awesome. What's the best free concert you ever attended? Blue Rodeo at HMV in the late 90s. 1975 Blind Melon Chitlin Yonge and Gerrard man. Free outdoor street concert at Yonge & Dundas. Sometime in the late 90's or early 2000's?? Anybody else remember this one? That REM show was my answer too. Skipped school in OAC to see it, so that would put it at 2000-2001. Does winning free tickets count? If so, I'd have to go with seeing Big Wreck at Lee's Palace in '97. Or Headstones in '98 at a club in Markham that I forget the name of. I'm afraid winning free tickets does not count. Eric Clapton, October 5, 1994. Jimmie Vaughn was the opening act and played with Eric on the encore. Sorry, I jumped the gun. The October '94 Eric Clapton concert was not free; however, it was the best concert I ever saw. 54-40 at Lakeshore Mardi Gras! Rarely ever get a chance to go to a concert and then no international bands. So I guess the 3 song 15 minute thingy by the FS Band back in 2007! Sound of Music Festival in Burlington every year has great performers. Festival of Friends every year in Hamilton had and still does have some great lineups. RHCP free show during the Scar Tissue tour was pretty great.. The Hip at an MCA function back in 1993. Took place in the indoor tennis courts at Grandview Resort in my hometown of Huntsville. I found out about it earlier in the day and then walked in like I belonged there, no one asked any questions. I leaned against the stage (it was just record company folks so it was not crowded) while The Hip played tunes from Fully Completely. They came off the stage and we got to chat and hang out with the band while The Headstones went up and performed. As a huge Hip fan, I was on cloud nine and the guys couldn't have been friendlier. Black Crows in (maybe) '90? Was at some park and put on by Q I think. I've seen lots of free shows, especially as a teenager living walking distance from Mel Lastman Square in the mid-90s, but I'm going to have to go with Devo at Dundas Square for NXNE a couple of years ago. Men Without Hats opened and I thought they were okay when their set ended, but after Devo was done, they seemed terrible. I saw The Tragically Hip in 1985 when I was visiting Queen's University in Kingston. It was at a bar on Princess St. This was in when they had a saxophonist which was cool for a 'rock' band. Gord was weird even back then.